Rueben Casserole – capture the special sandwich flavors in a casserole. 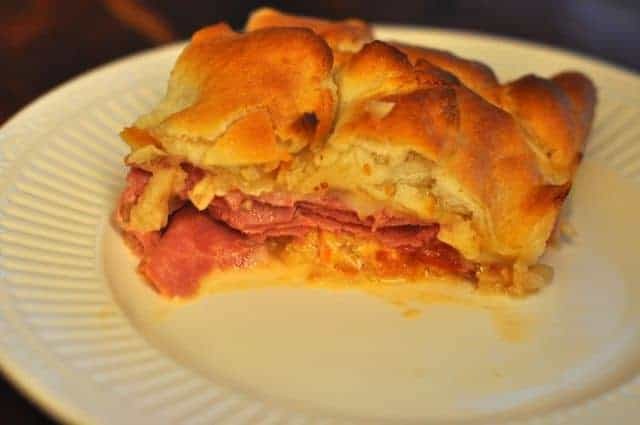 Home » Casserole Recipes » Reuben Casserole – capture the special sandwich flavors in a casserole. Everything that makes a Rueben sandwich special is in this casserole. This casserole reheats well. With a Reuben casserole, you can enjoy all of the flavors of a Reuben sandwich. Preheat Oven to 425 degrees. Spread sauerkraut in bottom of 12 X 8-inch baking dish. Top with tomato, dot dressing over tomatoes. Cover with Corned Beef, sprinkle cheese. Bake for 15 minutes. Remove from oven. Open biscuits separate into 6 then separate each into 3 layers; slightly overlap layers on casseroles to from 2 or 3 layers. Sprinkle with crackers and caraway seeds. Bake until biscuits are golden, about 12 - 17 minutes. Thanks to bckennyg for sharing this casserole recipe. This is a great way to use up corned beef!